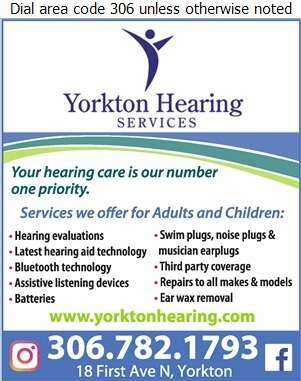 Yorkton Hearing Services provides diagnostic hearing testing by a Registered Master Degree Audiologist. We have the latest in digital technology as well as Bluetooth devices for greater freedom & flexibility. We strive to provide professional service and quality care to each individual. We offer assistive listening devices for telephone, T.V., or personal use at competitive pricing, as well as earplugs and earmolds. Our services include cleaning, repairs and adjustments to most of the major brands of hearing aids. Each individual is treated with the utmost dignity and respect. We build on-going relationships based on trust and reliability. We are committed to our patients hearing health care! Call us today to make an appointment.